Now, if I am ever going to bother to upgrade my phone, I would like to do so and eliminate carrying around the Axim. I.e., I want a phone that has WiFi, Bluetooth, WindowsMobile to run all my software on my Axim, expandable memory, can function as a modem for a laptop, and... oh, yeah, be a phone. I'm not sure such a phone exists yet (or for how much money? ), but another drawback for me has been the small screen size on phones. But maybe this is the solution: This is the not-yet-released REDFLY Mobile Companion. It connects to your phone (USB or Bluetooth), runs off the phone's operating system (WindowsMobile), and provides an 8 inch 800×480 display and a decent keyboard. Read this review of the beta and then check out the linked image gallery, especially this page which shows PocketBible on the screen. I could get used to that! Now if the device sells for its list of $500, I doubt that it would be worth it. Why not just get an ASUS Eee PC instead which is a fully functioning computer selling for $300-500? There are smartphones by Asus, HTC, and imate that fulfill your requirements in terms of what you are asking for to replace your Axim and be quite usable. The Redfly is designed for those who use their smartphone as their main computer and therefore have no need for something with a larger screen except in the case of major web browsing or document editing. Considering that one can purchase a 16GB memory card nowadays, and that smartphone and web software is mature enough to the point of getting things done, this type of computing paradigm is more than usable. Maybe not at the price redfly is charging, but definitely the idea has a lot of merit (especially since it was the thrid attempt at such an idea in the last year). 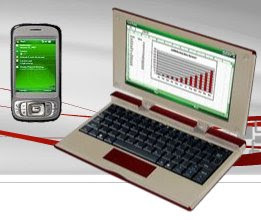 For those in places where their mobile is their copmuter, the Redfly is a suitable solution. Regarding the Asus EEE PC, I've been using a Linux desktop for a few years now and I'm able to run a full version of Bible Works pretty much flawlessly in Linux with WINE. I've been thinking about getting an EEE. Among other things I'd plan to put Bible Works on it. The only caveat is that you may need to get an external sd card to run BW because the amount of space you get with the EEE isn't that much.